Brighten up your child’s bedroom with colorful wooden vintage toy cars made by Dutch designer Ko Verzuu and his team at ADO. 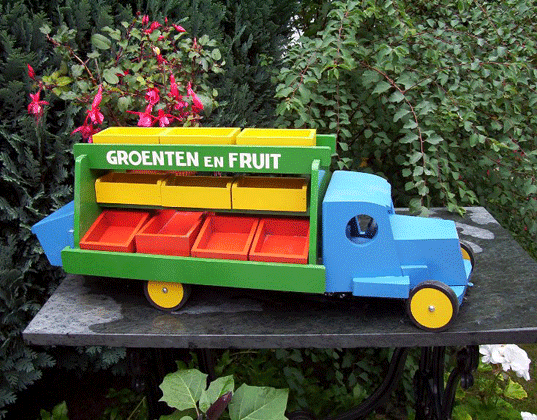 They made a fantastic colorful collection of wooden toys back in the 1930’s-1950’s in the Netherlands. However, Ko Verzuu’s team was much different than most toy companies, since most of the workers were patients in the sanatorium, Berg and Bosch. The workshop was part of a program designed to help patients transition from the sanatorium back into mainstream society and these beautiful handmade toys are the result. With a back story like that, Ko Verzuu’s vintage toys are highly coveted and collected. It does seem that Ko Verzuu’s son has begun to built exact replicas of his father’s toys, but while they’re amazing to take a look at they’re not yet available. You could start your child his very own Ko Verzuu for ADO collection of vintage toys from online sites such as Mid Mod Design. Who wouldn’t love a colorful collection of vintage trucks for their bookshelf? love love love the back story here! Brighten up your child's bedroom with colorful wooden�vintage toy cars made by Dutch designer Ko Verzuu and his team at ADO. They made a fantastic colorful collection of wooden toys back in the 1930's-1950's in the Netherlands. However,�Ko Verzuu's team was much different than most toy companies,� since most of the workers were patients in the sanatorium, Berg and Bosch. The workshop was part of a program designed to help patients transition from the sanatorium back into mainstream society and these beautiful handmade toys are the result.